UCSC has only one PayPal account; currently, BSOE is the only Division with the authorization and ability to use its services. As such, in order to have access to the UCSC PayPal service, a BSOE email address and a BSOE FOAPAL are required. In order to connect a BSOE webpage to PayPal, an individual PayPal Item must be created. Each event (workshop, conference, etc.) or activity (commencement DVD sales, etc. ); requires a single PayPal Item. A separate BSOE PayPal Item Creation Form is to be completed for each event or activity. It is highly recommended that interested BSOE units contact the BSOE PayPal Technical Sponsor to discuss the technical implications and requirements. Please note that a new BSOE website cannot be established until the PayPal Item Creation Form is complete and on file with the BSOE Business Office. Item Sponsor - The requesting unit's contact person who manages the event or activity for which PayPal payments will be received. Liaise with customers and Technical Sponsor for all front-end PayPal activity. Tier-1 Fund Manager (Authorizer) - Individual with delegated authority over the FOAPAL into which the PayPal revenue will be deposited; individual must also have delegated authority for all the types of transactions for which these funds will be used. Tier-2 Budget Approver - Varies depending on the FOAPAL being used, typically the designated Research Accountant. A Tier-2 Budget Approver is responsible for reviewing the data for legitimacy and appropriateness of expense/revenue against the given FOAPAL. Signs form to acknowledge the establishment of a new source of funds, based on PayPal transactions, linked to the designated FOAPAL. Reconciliation of revenue deposits with activity-related expenses and transactions. PayPal Technical Sponsor - Their signature on the form reflects an acknowledgment that the associated web page is to be kept INACTIVE until the established PayPal activity start date. Assists with the development and implementation of the associated BSOE webpage to be linked to UCSC's PayPal Account. Financial Sponsor (BSoE Business Office) - Signs form to acknowledge the establishment of a new source of funds, based on PayPal transactions, linked to the designated FOAPAL. Signs form to acknowledge the establishment of a new source of funds, based on PayPal transactions, linked to the designated FOAPAL. Starting with Section A, the Item-Sponsor will fill in their information including Name, Phone, Email, and MailStop. Item Sponsor is the requesting unit's contact person who manages the event or activity for which PayPal payments will be received. The Description provided will be visible to the customers using PayPal and thus should be very detailed and clear. Mark the Sales Tax Applicable box if you are using PayPal to receive revenue for for an item that requires sales tax. If the item-sponsoring unit is selling physical goods, the financial sponsor is responsible for noting the amounts of sales tax to be accrued on the spreadsheet sent to General Accounting. The Revenue FOAPAL information should include Fund, Org Code, Account Code and Activity Code if applicable. The Account Code is to be either a revenue account code or cost-recovery account code. Revenue Acct Codes are used when generating revenue. Cost-Recovery Codes are used when recovering costs for an event. If your PayPal item is for Cost recovery, please leave the Account Code blank. It will be filled in by the Financial Sponsor. Item Sponsor and Tier-1 Fund Manager authorizations are required for processing by the Business Office. Item Sponsor is the requesting unit's contact person who manages the event or activity for which PayPal payments will be received. Tier-1 Fund Manager has delegated authority over the FOAPAL into which the PayPal revenue will be deposited. Tier-2 Budget Approver’s authorization will be obtained by the business office financial sponsor and thus does not need to be collected by the submitter. In the event that one of the people listed above becomes unwilling or unable to perform these duties, a new PayPal Item Creation Form must be completed and signed by all new parties. For PayPal items that repeat, such as Commencement or annual conferences, this form must be re-executed at least once per year. 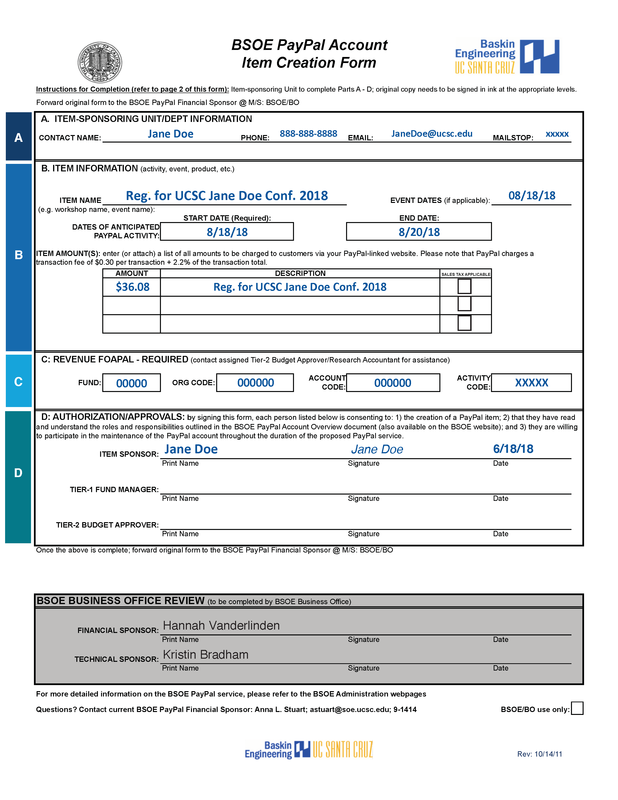 This form must be fully executed and signed before a PayPal item can be created and the associated BSOE webpage made active. For information regarding the set up of a Divisional PayPal account in another division, please reference this guide for PayPal Formal Procedures PDF.